Life revolves on plastic money and credit….. people purchase things online and in the shops using Credit cards and walk with pride into ATMs withdrawing money so frequently. The cards gives flexible access to money…….there can be some trouble too…. There have been rare occasions on upon inserting the card on the slot and tapping the pin, money does not come out – but the account gets debited ! – or the machine takes back the cash, when the user is engrossed in mobile (currency retraction does not happen now though !) – there have been rarer cases of ATM dispensing more than what was sought to be drawn and debited. Just like any other machine, ATMs too are prone to mistakes ~ and when that happens, it can cost one time and money. The banking instructions would say that ‘always get a printed receipt’ for it contains important information such as the transaction date and time and the machine identifier; however at the time of withdrawal ATM would ask – whether you want a printed receipt of this transaction, - most of us would click ‘No’ – or would not bother to keep the receipt ! Today people of Scotland are voting on whether the country should stay in the UK or become an independent nation. 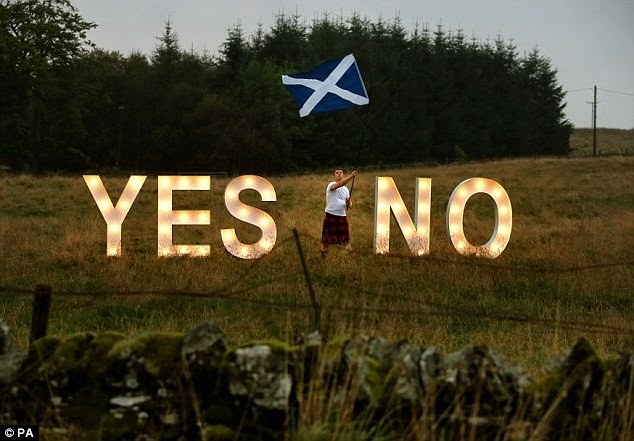 Voters will answer "Yes" or "No" to the referendum question: "Should Scotland be an independent country?" ………… and did you imagine that it can have a great impact on bank, ATMs and cash flow ……….. read this report in Daily Mail. Banks have been transferring millions of banknotes from England into Scotland ahead of referendum amidst fears high demand on cash machines if the country votes for independence. It is still not clear what currency would be used in an independent Scotland, meaning that some Scots could rush to withdraw as many pounds as possible in the event of a Yes vote. In anticipation of the poll, extra supplies of cash have been moved north of the border to reassure Scottish account-holders that they will have access to their money, according to reports. Alex Salmond is keen to set up a formal currency union between an independent Scotland and the rest of the UK, with the pound backed by the Bank of England as it is now. But Westminster politicians have rejected this ambition, insisting that if Scotland used the pound it would have to be on an informal basis, without a central bank guaranteeing the country's debts. This might lead to an independent Scotland setting up its own separate currency - leaving Scottish people's savings at risk of being devalued if the country runs into economic trouble. As race goes down to the wire Cameron insists he has no regrets over handling of independence debate... but will now stay in England until after the referendum. The last-minute bribes are being offered to stay in the UK. Another insider told the Daily Telegraph: 'It is prudent for banks to stock up on demand. This happens normally in the run-up to Christmas, and in that sense the referendum is no different.' Banknotes are printed by the Bank of England, but their distribution is controlled by a small group of institutions including the Post Office, Barclays, HSBC and the Royal Bank of Scotland. They have been delivering huge quantities of cash to banks in Scotland so they can stock up at branches and cash machines. However, the Bank of England would stand behind the pound in Scotland as well as the rest of the UK at least until March 2016, when the country is set to split in the event of a Yes vote. In another attempt to reassure banking customers, financial institutions such as the Royal Bank of Scotland and Lloyds have promised to move their headquarters to London if Scotland becomes independent, so they can enjoy the support of the UK Government. Another potential danger for Scotland's economy comes from Alex Salmond's threat to default on the country's share of UK Government debt if Westminster refuses to enter a currency union. The National Institute of Economic and Social Research said that such a move would shut off Scotland from international markets, forcing the Government to balance its budget immediately. Mark Carney, governor of the Bank of England, has predicted that Scotland would need to build up billions of pounds of capital reserves to guarantee the national debt if it is not in control of its own currency. So a birth of a Nation is certain to have labour pangs, even when things are peaceful and through a referendum – whether it happens will be known all too shortly.